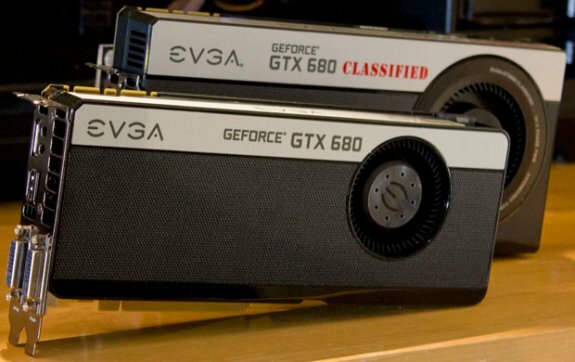 The Tech Report spotted EVGA's GeForce GTX 680 Classified at Computex, this model features a hot-clocked GPU with 14-phase power system, 4GB GDDR5 (double as much as standard) and a larger version of the blower found on the standard card. You can expect it to become available later this month. This Classified version of the GTX 680 features a hot-clocked GPU fed by a 14-phase power delivery system. The reference design uses only four phases, EVGA says, and a custom PCB was required to accommodate the additional power circuitry. Rather than making the card longer, EVGA made it taller. The difference is nicely illustrated in the picture above. You'll notice that the Classified uses a larger version of the blower found on the standard card. Most graphics card makers seem to be relying on multi-fan coolers these days, but EVGA prefers this blower setup because it pumps hot air out of the case rather than recirculating it. EVGA also showcased the Signature GTX 690 Hydro Copper, which features a custom water block (that will be available separately, as well).